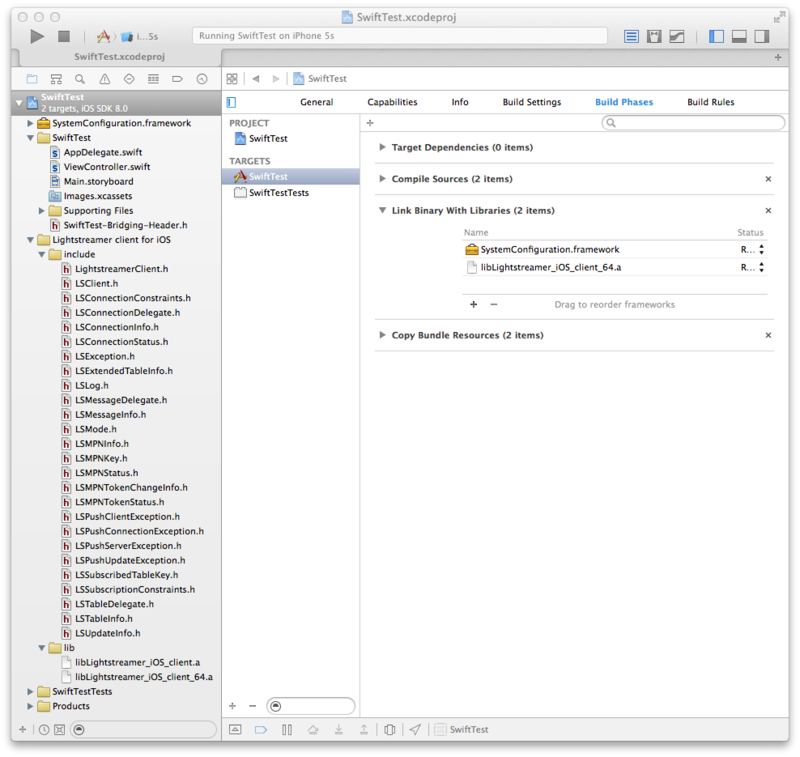 Of course the Lightstreamer iOS client library is written in Objective-C. To be used with Swift it requires a "bridging header", a special .h file that imports whatever of Objective-C is going to be used inside Swift sources. The simplest way to create it is adding a fake .m and let Xcode propose to you its creation. In this way you will be sure the header file and its path are correctly set up in the build settings. Once done, you can safely delete you Test.m file. Now import the Lightstreamer iOS client library in your project, like you would have done with Objective-C (e.g. by dragging its lib and include directories in your project), and make sure the libLightstreamer_iOS_client_64.a file is in the Link Binary with Libraries section of your Build Phases tab. Since Swift is supported by iOS 7 and above, you can safely use the combined 32/64 bit version of our client library. Note the bridging header and the imported headers and libraries in the Project Navigator, and the two libraries in the Build Phases panel. If you are using a 1.2.x version of the client library you will see fewer headers under the include group. That's normal since 1.3 introduces new objects for mobile push notifications. Your project should now build with no errors. Note that Swift introduces two statements for creating variables and instance variables: var and let. While the former creates a common variable, the latter creates a constant, i.e. a variable that can't be changed (and if it is a collection it's immutable). It is the equivalent of final with Java. The compiler can apply important optimizations when it knows an object can't be changed, so choose your statement appropriately. In this case, we are not going to change our background queue, so we can use let. Here we connect to the online Lightstreamer demo server, but feel free to put whatever host or adapter set you need to connect to. Unfortunately, Swift misses the #pragma mark directive that I found so useful with Objective-C, so we revert to old style comments to split the source code in segments. There are rumors that something similar to a #pragma mark will be added in the future. In the code above you can also see the new Swift string composition: if in the middle of a string you put a backslash-parenthesis pattern, you can follow it with any language expression and the compiler will appropriately format the result. Quite practical (and, as such, typically Apple). never ever ever start lengthy/blocking operations during connection events (or any other event), as you will delay subsequent events and, with libraries pre 1.2.6 and pre 1.3 alpha3, may even cause deadlocks and disconnections. All this is stated in the library's API docs, but repetita iuvant, as my Roman ancestors were used to say. subscribe when the session is started, but only if we haven't yet done so. This time it is a variable, as it will change during our run time, and it is optional, as it is initially null. Optionals are one of the strongest changes between Objective-C and Swift, as the former will completely ignore null pointers, while the latter will come to great lengths to enforce pointer checking. More on this later. The item and fields subscribed here are those of the demo chat room. As introduced before, we use the table key as a memory of a previous subscription. If we didn't keep a memory and subscribed tout court, each time the library reconnected we would add a new subscription to previous ones. In this way we could accumulate 5, 10 or more subscriptions, each one sending its own snapshot, leading the app to a mess of events and eventually to a stall or a memory warning. Recall that optionals are not pointers: here message, timestamp and address are string optionals, as they could be null, and as such they can't be used in a string composition (or in any other API that requires a string). They must be unwrapped first, which is what that little exclamation mark does. Note that we applied point 4 of the above 6. The prefix in the message composition is due to the way the Lightstreamer demo adapter handles messages. If you are not an experienced Lightstreamer server-side developer just trust that this will work with the online demo chat. Where "CHAT_SEQUENCE" is a symbolic identifier used by the server to keep messages in sequence, i.e. all messages received with the same sequence identifier are kept ordered and serialized. Note that when using asynchronous messaging there's no need to call the API on a background thread, as the client library will do this for you. With this last snippet, we have concluded our sample code, but there's room for some considerations. Choosing a language or another is a matter of taste, so take what follows as my personal opinions, and not the official position of Weswit. Man, that was tiring. Objective-C made everything simpler: just use your pointer, if it is null nothing will happen. Nothing, not even a log line. So, code looked shorter and clearer, since ifs and trys were there just when needed, not spread everywhere like chickenpox bubbles. Unfortunately (in my opinion), the approach of Swift is exactly the opposite. Pointers can't be null, full stop. To consider null values, you have to wrap them inside optionals. In some way they remind me the references of C++, which can't be null either. This mechanism forces the developer to introduce syntax changes each time a pointer can be null. That is: a potentially null pointer is type-checked during compilation. We have tableKey and updateInfo which are implicitly unwrapped, while itemName is optional. This means that the compiler will check that you don't use itemName as a string without unwrapping it first, but will not do the same check for tableKey and updateInfo. If you touch an implicitly unwrapped optional with a null value, you get a runtime error. That is: a crash. I don't know why it chose to map parameters of the same event in two different ways, maybe the book "Using Swift with Cocoa and Objective-C" explains it somewhere. But I'm betting a coffee this kind of things will make swear a lot of developers. Here we have another weak point (in my opinion) of Swift: there's no structured exception handling. If an API you are using throws an exception your app crashes. In our client library we make quite a liberal use of exceptions, as it is traditionally a good object-oriented programming pattern. But we are not the only one: even the iOS Foundation library makes use of them. Try accessing an array beyond its bounds, for example. Or try writing to a closed file. These are all situations where exceptions come in handy. My hope is that they will introduce them in a future release of the language. In the meantime, our client library should provide all the instruments needed to avoid exceptions preventively. For example, by checking that your LSClient instance is connected before calling a method that requires connection (as reminded at point 4 of the above 6). If you should discover cases where you can't preventively check for an exception-throwing condition, let us know. If Apple should persist with the lack of exception handling, we are prepared to wrap some of the APIs with an alternative version that fills an NSError. This is another common error handling pattern in the iOS Foundation library, developers should find themselves at ease with it. Last but not least, Swift also lacks synchronization primitives. Here, fortunately (in my opinion), we can use the low-level Objective-C APIs to fill the gap, even if it is not exactly the same. If hasSomeCondition() is true, the synchronization lock is not freed up and your app will sooner or later enter a deadlock. The same code with the @synchronized primitive would avoid this situation, as the synchronization lock is freed up automatically. So, pay attention when you use synchronization APIs. We have recently released a new example on our GitHub repository: the iOS Swift Chat demo. It is a simple iPhone chat app developed with Swift, from which most of the code presented here has been taken. It is a single-view app, making use of subscription and send message APIs. Take a look for a complete project, ready to be run on your device. 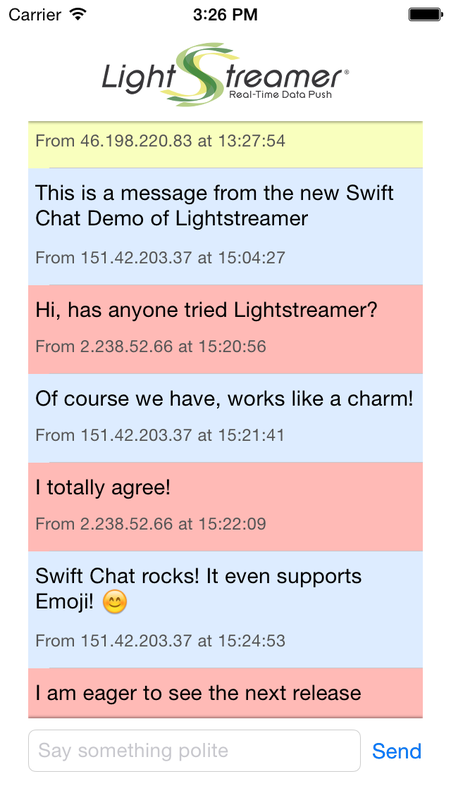 Our sample code and our new chat demo show that the Lightstreamer iOS client library is already usable with Swift, with no limitations. Anyway, besides personal opinions, remind that Swift is a work in progress. It's too early to cast final judgements as it is too early to definitely adopt it in place of Objective-C. As it happened with Objective-C and many other languages, by the time Swift reaches maturity it will be quite a different (and better) language than today.